I’m a real fan of the good ol’ Burger, but it has to be a good one. I can’t stand sloppy, soggy, over-filled or measley burgers and often, the prices being charged or the image prompting the purchase doesn’t quite match the product that arrives on your plate. I also understand the whole “value-for-money” ideal, but to me, that doesn’t mean I want as much as humanly possible balanced on my plate filling every square inch. To be honest, I’m really put off by an over-full plate. OK, so to put it quite plainly and if I have to admit it myself, I am FUSSY about my burgers. To that end, I have to let you know that it has become apparent that I prefer my own home-made burgers by far. My family also make very satisfied noises to that effect when I bail out of cooking a “real meal” and we decide on “home-made take-out”. I just haven’t perfected the wedges. They seem to be my nemesis so I will continue my quest for wedges/chips (and I don’t mean a packet of store bought oven ones…) but in the meantime, that isn’t putting me off my burgers. Last night I decided on Chicken burgers (we enjoyed the beef ones a couple of weeks ago and I will share these another time). I always prefer using deboned and skinless thighs. The meat is darker, yes, but the flavour is far more intense than the ever popular breast. I often find breasts tough and dry, but that could just be me. I like to crumb the flattened thighs to add another level of flavour and crunch, but grilled thighs are just as good. Preheat the oven to about 180°C and line a baking tray with parchment paper. Trim fat from thigh meat and place thighs into a plastic bag or between two pieces of parchment paper. Using a heavy rolling pin, bash or roll them until they are fairly flat but not too thin. Beat the eggs in a bowl. Spread the bread crumbs onto a plate. Pat the chicken dry using paper towels, then dip into the egg and smother in the bread crumbs. I like to lay them flat on a baking try or large plate and then leave them in the fridge for about a half an hour. Prepare the burger buns by adding a layer of lettuce, red onion and tomato slices. Grate a little of the lemon rind, being careful not to take the white pith as this is very bitter. Add this, along with the juice of the lemon to a tablespoon or two of your favourite mayonnaise (home-made is always good but doesn’t last as long as store bought). Again, quantities will be determined by the number of burgers you’re making, but you want the lemon flavour to sing through the mayonnaise without being too overpowering. In a frying pan, heat the olive oil and gently fry the crumbed thighs for about 8 minutes a side until the meat is cooked but still succulent and juicy (juices must be clear, not pink). The crumbs should be a beautiful golden colour. Depending on the size of your pan, fry 2 – 3 thighs at a time, don’t overfill the pan or the oil will cool and the food will stew instead of fry. Place the cooked “patties” onto the prepared baking try and cover with a couple of slices of your preferred cheese. Melt this under the grill for a few minutes – do this altogether once all “patties” have been cooked in the pan. Don’t leave it too long, watch it carefully until the cheese just begins to spread and bubble. 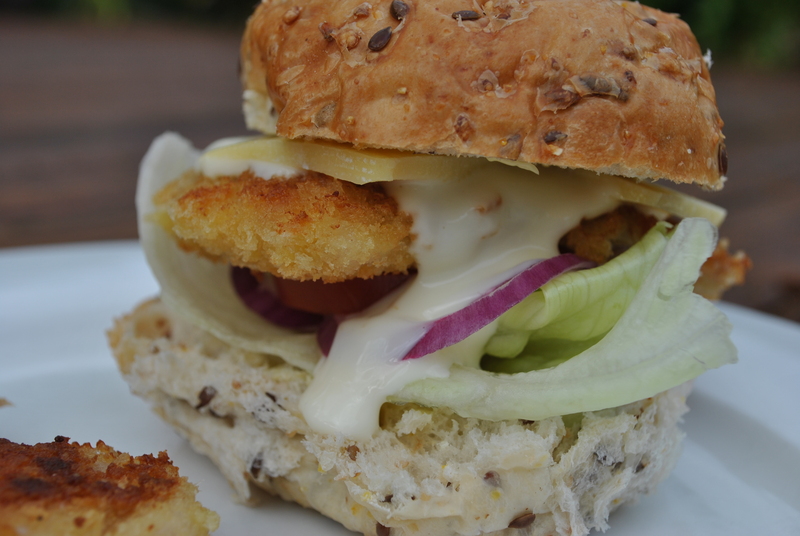 Now build your burgers, finishing off with a generous dollop of the lemon mayonnaise.